Read & Quiz is a series of the Chelsea Young Writers book reviews & comprehension quiz competitions. Young readers are invited to enter a monthly quiz competition by reflecting on the books they’ve read and sending their full answers to the comprehension questions to Chelsea Young Writers. The winner receives a certificate award & an Amazon voucher worth £10! Back in Afghanistan, Sami’s grandfather was a famous musician. Even now in Boston, the sound of his instrument, the rebab, is the sound of home. Then the rebab is stolen and appears in a shop for $700. Sami has no money and nothing to sell. What he does have is something to trade. But there are two sides to every bargain, and Sami’s chance of success depends on the very last thing he wants– help. 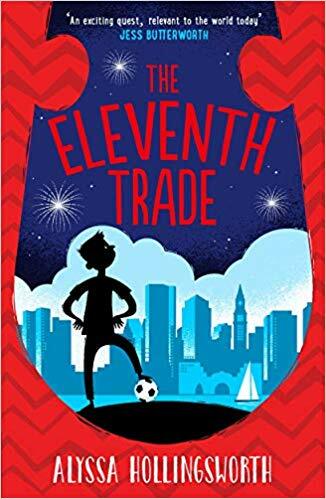 The Eleventh Trade is the tale of Sami, a football-mad, Afghan refugee in Boston, America. The rebab, the traditional Afghan instrument, is Sami and his grandfathers’ only source of livelihood. When the rebab is stolen and appears in a shop, Sami must find a way to get it back, even if it means trading everything he has. When his Baba takes a poorly-paid job washing dishes, Sami begins exchanging items with his peers at his new school. He trades his precious Manchester United keyring for a broken iPod, the iPod for some figurines… His goal is simple: if he can raise enough money to buy the rebab back, he’ll be able to gift it to Baba for Eid al-Fitr, the celebration of the end of Ramadan. Along the way, Sami must learn to trust his new friends and face up to the traumatic memories of war and displacement that haunt him. This is a painfully beautiful story that reveals the truths of the refugee crisis and paints Islam and the Afghan culture in a positive and informative light. It’s skilfully written with an authentic portrayal of Afghanistan’s vibrant culture (experienced first-hand by the author), post-traumatic stress disorder and the ways in which diverse cultures can come together as one. Sami is a kind, relatable character whose story gives the reader an insight into the lives of today’s refugee children, and the secondary characters in the novel set an example of what it means to be welcoming of others. Aimed at readers age 8 to 14, this irresistible adventure promotes acceptance and tolerance and reminds us of the priceless value of friendship. Submit your full answers to info@chelseayoungwrites.co.uk by 31 December 2018. The December Winner to be announced in early January 2019. Entrance age: 8-14 Yrs, state your age when contacting us. Sami had to trade a lot of things to buy the rebab back. If you had to get back your family’s heirloom, which of your things would you trade and why? America and Afghanistan are two very different countries and cultures. What are some of the differences between them that Sami mentions in the book? Think about the clothes, the smells and the way people act. Sami had to leave his home as a refugee without his parents. How do you think he felt when he came to America for the first time? Peter was cruel to Sami and called him many bad names instead of welcoming him. If you meet a refugee one day, what could you do to make him or her feel accepted? How did you feel when Sami found out that the man at the shop had sold the rebab to someone else? Did you think Sami was going to give up? What would you have done? What was your favourite part of this story? Was there a part that you didn’t like? Why?